OTTAWA—Canada formally acknowledged reports that the Chinese regime is engaged in organ harvesting without consent for the first time at the United Nations on Wednesday. Canada’s statements at the United Nations are often noteworthy for their specificity and forcefulness, a trend that continued last week. 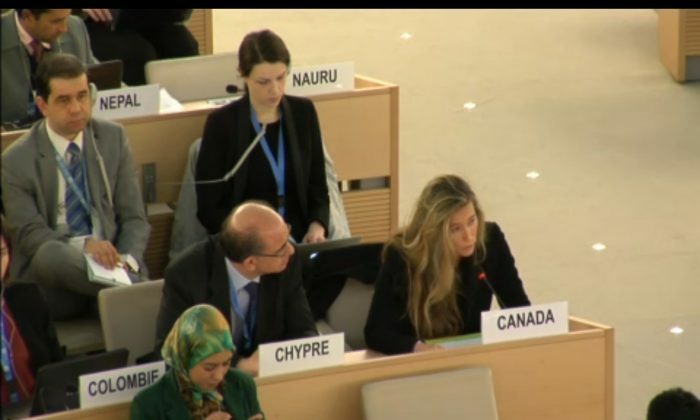 Canada’s comments were the only ones to prompt response from specific countries, as most other countries speak in generalities and those with documented abuses use the opportunity to make couched statements that deflect from their own human rights issues. Canada’s human rights adviser at the U.N., Anne-Tamara Lorre, set the precedent during the Interactive Dialogue on Freedom of Religion at the U.N. in Geneva. The dialogue was focused on reports from two human rights-related special rapporteurs at the 22nd meeting of the current session of the Human Rights Council. “Canada remains deeply concerned about the plight of persecuted religious communities in various parts of the world where, either due to government restrictions or extreme social hostilities, individuals are targeted because of their faith. These include Baha’is, Buddhists, Christians, Jews, Sufis, and other Muslims, among others,” Lorre said. She went on to note the third anniversary of Shahbaz Bhatti’s assassination. Bhatti was Pakistan’s Minister for Minorities Affairs and an outspoken critic of his country’s blasphemy laws, which targeted religious minorities. Lorre went on to make what seems to be an unprecedented acknowledgement of reports of organ harvesting in China. Allegations that the Chinese regime has been harvesting organs from political prisoners have persisted since 2006 when two Canadian human rights lawyers, David Matas and David Kilgour, published their report on the topic. Evidence has continued to mount since then, with investigative reporter Ethan Gutmann uncovering that organ harvesting from executed religious minorities appears to have begun in Xinjiang, a province in China home to Uyghur Muslims. Gutmann’s book on organ harvesting in China, “The Slaughter: Mass Killings, Organ Harvesting, and China’s Secret Solution to Its Dissident Problem,” is due out in August. Lorre’s statement prompted a denial by the Chinese regime, which categorically rejected her comments. Last December the European Union Parliament passed a resolution regarding organ harvesting in China. The resolution noted that advertisements from Chinese transplant centres pledged organs could be found in two to four weeks. Investigators, including Matas and Kilgour, say that such a pledge would require a huge bank of potential donors who could be killed on demand. Hundreds of thousands of Falun Gong adherents have been imprisoned in China, many never to reappear. Canadian Michelle Zhang’s sister is one of them. Zhang, who now lives in Toronto, said her sister, Yunhe, disappeared within the prison system after her 2002 arrest. Prison officials now deny ever having detained Yunhe. China has never allowed an independent investigation of its organ transplant system, and has continually changed its explanation for the source of organ transplants. The regime went from denying it used organs from executed prisoners, to admitting a few years ago that it did. The health official responsible for organ transplants, Huang Jiefu, then pledged in 2013 to phase out that practice. After leaving the ministry to head up the China Organ Donation and Transplant Committee, the country’s top official transplant organization, Huang changed his stance and said that the current system of sourcing organs from prisoners should be expanded rather than retired. Reports of organ harvesting in China have prompted some countries, including Israel, Taiwan, and Australia, to make legislative or regulatory changes around citizens travelling to China for transplants or around training Chinese transplant surgeons. The 25th session of the United Nations Human Rights Council began March 4 in Geneva.